to have your biggest year in business yet!! Module #1 - 25 Ways To Effectively Get More Clients. You will discover 25 effective (some super easy, some involve more effort), marketing strategies you can deploy immediately to start getting clients NOW. No more wondering, "What should I actually DO to get clients?" This is where you will learn to put together a marketing calendar. We will talk about how to accommodate your personal life as well as your business life. The best part is, you make the plan so you don't overwhelm yourself and so you leave room for creativity. Learn the secrets of how to put together a smart marketing calendar that fits your needs. No more side stepping your priorities! What you want is for you to actually EXECUTE what you said you are going to do. In this training you are going to learn my 10 best strategies for STOPPING Self Sabotage (and your inner critic) in it's track (this is like sending you to the front lines with your full armour). You will receive the, "Ultimate Productivity Blueprint" to help you get more productive immediately. Part of this process is about helping you manage your time better. We all have the same 24 hours in a day yet some people seem to get more done in a day than others do in a week. Wouldn't you like to have days that are super productive and fun? That are highly motivating and profitable? You CAN do it and this bonus will help you!! This bonus is invaluable! Discover 16 ways that you can easily get more discovery calls today!! Finally have consistent marketing that works. 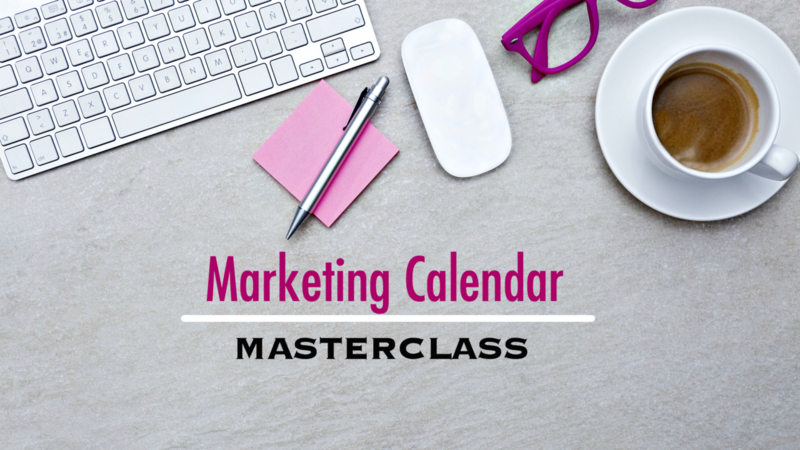 After completing Marketing Calendar Masterclass you'll be confident and focused on what needs to get done to get results!